The Golden Content Triangle: Owned, Earned, Paid | ASTRALCOM - Content Strategy, Conversion Marketing and Customer Acquisition. 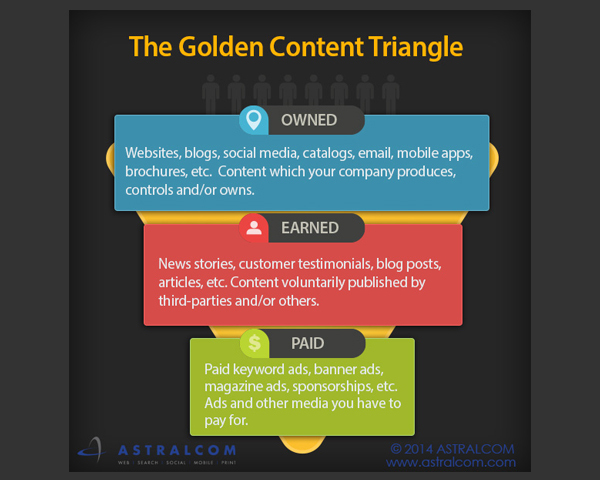 The Golden Content Triangle: Owned, Earned, Paid | ASTRALCOM – Content Strategy, Conversion Marketing and Customer Acquisition. The challenge for most businesses is to keep the Owned, Earned and Paid Content machine running with engaging, informative and relevant content, in all three areas, on a tight budget. The solution here is to develop a content optimization strategy that can be leveraged across channels. Read our post on this important topic and make sure you’re on the right track.